The Czech Republic must be analogue heaven. How else can you explain the plethora of designs in Pro-Ject's portfolio? By looking at the markets to the West might be the more rational answer, not least the UK, where our remarkable sense of taste has kept vinyl in a rather more buoyant state than most other countries. Pro-Ject has been revamping its range recently... and now it's time for a new version of the distinctive RPM 6. The changes are small, though. The overall style and build remains as before with a massive MDF platter sitting atop an acrylic subplatter, which is supported by an inverted ceramic bearing. The change here is that the platter now has peripheral mass damping: steel shot has been added to enhance inertia and to aid the dissipation of heat from the bearing in the process. The platter surface is actually vinyl, the idea being that by using the same material as the software you can drain the resonances within it more easily (a scheme used successfully by Funk Firm's Achromat and Achroplat), and a heavy unthreaded clamp is supplied to aid the process. Drive is courtesy of a suspended motor with electronic speed switching via a box under the chassis. The on/off switch is hidden under there as well, and we really do mean hidden, but it's not hard to find with practice. Refinements have also been made to the chunky 9c carbon fibre tonearm, which has thicker walls than its predecessor and uses ball rather than gimbal bearings. As ever with Pro-Ject tonearms, the arm lead is interchangeable and you can adjust most everything including arm height and azimuth. Height cannot be reduced that much, however, and not enough for many cartridges to be set up with correct VTA. Isolation is provided by Sorbothane-damped metal cone feet that can be used to adjust for level, but are better left tight with the support being properly levelled first. You seem to need three hands to fit a cartridge to the 9c, because the arm clamp is not very firm. You also need to push the arm lift all the way down before you return to your chair, otherwise the needle will hover over the vinyl indefinitely. Once it's in the groove, however, things are rather more gratifying. The RPM 6.1 delivers an open and expansive sound with good treble extension and plenty of energy. 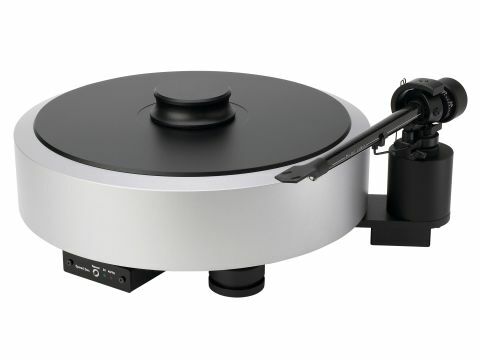 We found this was especially noticeable when we compared it to a Rega P3, a less expensive albeit capable design. On the other hand, next to the similarly priced Funk Firm turntable with a Rega RB250 arm, the Czech design is not quite as vibrant-sounding, but it's better at coping with energy in the support furniture. We like the way it can dig down into the bass, stopping and starting at that end of the spectrum with apparent ease. Felix Laband and Leftfield both provided a tuneful result in its care, the former even throwing out some out-of-phase detail that put the sound well into the room. It also has a good grasp of image depth, when given a cartridge that can do this well. It dug up almost hidden layers on Taj Mahal's Sweet Home Chicago, allowing us to clearly differentiate the Pointer Sisters on backing vocals from Taj and his guitar up front, singin' the blues. Musical tension is also well served thanks to the way it gets a handle on micro-dynamics and tracks the fine details. All in all, this is a capable and attractive turntable that is clearly keeping pace with the times. The upgrades that Pro-Ject has lavished on the RPM 6.1 have clearly been positive as this is a steady and revealing design that's capable of fine results with a decent cartridge. It also looks the part with its minimal chassis and huge platter!